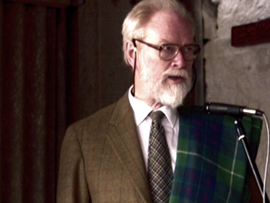 The history of Mitchell’s Glengyle distillery is a long and colourful one, but one which begins with a man named William Mitchell. William was the son of Archibald Mitchell, the founder of nearby Springbank Distillery. In the second half of the 1800s William ran Springbank Distillery in a partnership with his brother John, while the other brothers and sister were active running the old Rieclachan Distillery across the town. The family were not just distillers but also farmers, which was quite a common thing in those days. The growing of barley and production of farmers’ feed (a bi-product from mashing) meant that it made sense to run a distillery as well as being a farmer to keep the cost down. 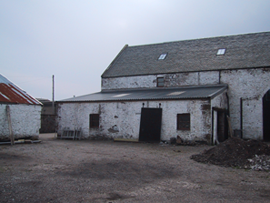 The farming element in the partnership with John didn’t run very smoothly – allegedly the two brothers had a quarrel about sheep – and this saw William leave the family business to start up his own venture, Glengyle Distillery on the corner of Glebe Street and Glengyle Road, just down the road from Springbank. Mitchell’s Glengyle Distillery was founded by William Mitchell in 1872 and he ran the distillery as a sole proprietor.Like the majority of Campbeltown distilleries, Glengyle suffered greatly during the economic downturn at the beginning of the 20th century. It was bought by West Highland Malt Distilleries Ltd in 1919 then sold again in 1924 for the princely sum of £300, before production finally ceased altogether in 1925. The entire spirit stock from the Glengyle Distillery was auctioned off on the 8th of April that same year. Despite not producing any more spirit, the Mitchell’s Glengyle Distillery buildings remained in relatively constant use right up to modern days. In the 1920s the building was rented out to Campbeltown Miniature Rifle Club for a number of years and the buildings were later used a depot and sales office for an agricultural company and so it remained the best preserved of all the former Campbeltown distilleries. Possibly because the buildings were so well preserved, a number of attempts have been made to re-open Glengyle Distillery in the past. The first was a mere 16 years after it had closed down when it was bought by the Bloch Brothers, then owners of Glen Scotia Distillery, who planned to rebuild and extend Glengyle. The war intervened however and nothing came of it. A further attempt was made in 1957 when Campbell Henderson applied for outline planning permission to undertake a £250,000 modernisation of Glengyle and re-open it but again nothing came of it. Third time lucky though as in November 2000, 75 years after Glengyle had last produced spirit, it was announced that the buildings had been bought by a new company, Mitchell’s Glengyle Limited, headed by Mr Hedley Wright, chairman of J&A Mitchell and Co Ltd, and great-great nephew of William Mitchell, original founder of Glengyle. Why name the whisky Kilkerran? Kilkerran is the name that was chosen for the single malt produced at Mitchell’s Glengyle Distillery, there are two reasons for this. Firstly, because the name Glengyle is already used for a blended Highland malt and Mitchell’s Glengyle Ltd were not able to purchase the rights to use that name. They also wished to avoid any possible confusion between the newest single malt to come from the Campbeltown region and a pre-existing blended Highland malt. Secondly, and more importantly, Mitchell’s Glengyle Ltd are very proud to be continuing and adding to the great Campbeltown Distilling tradition and the choice of name reflects that. Kilkerran is derived from the Gaelic ‘Ceann Loch Cille Chiarain’ which is the name of the original settlement where Saint Kerran had his religious cell and where Campbeltown now stands. Kilkerran is thought to be a suitable name for a new Campbeltown malt since it was unusual for the old Campbeltown distilleries to be called after a Glen, a custom more usually associated with the Speyside region. When bought in November 2000, the Glengyle buildings were but a shell, inhabitable only by the pigeons who made their home amongst the long forgotten agricultural machinery. Mitchell’s Glengyle Distillery Ltd were faced with the herculean task of transforming this abandoned, albeit architecturally sound, Victorian building in to a shining modern distillery, the first of the new millennium. What followed was a massive clear-up operation; scrapping all the machinery that had lain dormant since the days of the Kintyre Farmers’ Co-operative, chasing our fowl friends from their long-established roosts and wind and water proofing the buildings in preparation for the real work to begin. Although structurally sound, the Glengyle buildings needed a lot of work to bring them up to standard. The first year or so was taken up with the civil restoration work. 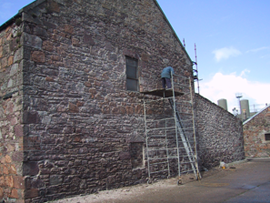 As a grade B listed building any restoration or renovation had to be sympathetic to the original. With this in mind the buildings were re-roofed, gutters replaced, new windows and doors put in and all the exterior walls chipped and pointed to restore it to its former glory. Inside roof joists were replaced, new skylights put in to allow more light in and a new concrete floor and drainage system installed in the future production building. By January 2002 all the civil work had been completed and production equipment started to arrive. 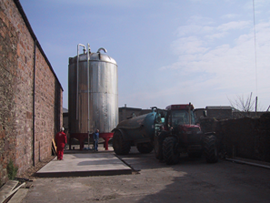 Second hand stills and distillation equipment from Ben Wyvis Distillery were sourced and brought to Campbeltown, kept in the lean-to out back until ready to be installed. The mill too was brought down from Craigellachie Distillery also to be kept in storage until required. The first piece of equipment had also been installed in the form of the Spirit Receiver Warehouse Vat but as yet the main production building remained empty. Early 2003 saw the arrival of Forsyth’s the contractors chosen for their vast experience with distillation production and maintenance. March was dedicated to getting the drainage system in place and fitting the effluent tank behind the production building. 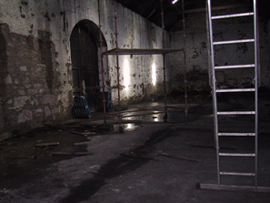 With that in place, work could begin inside transforming an empty canvas into a brand new distillery. 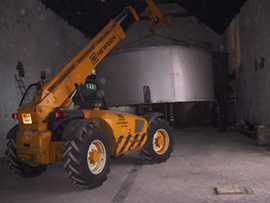 The mashing equipment was the first to be fitted, arriving by the lorry load in April. The custom built stainless steel mash tun arrived in two halves along with the two water heaters and the draff bin. Much of the steel work which would support the working platform was also put in place at this time. 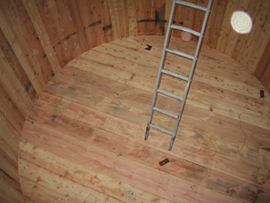 With the structure of the working platform in place, the stills were now ready to be fitted. 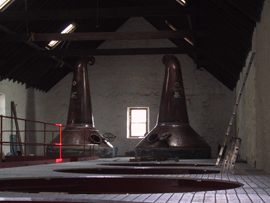 While the still were sourced at Ben Wyvis Distillery, the shape has been altered somewhat to produce the spirit desired at Mitchell’s Glengyle Distillery. One wash still and one sprit still are now in place with the necks now soldered on to the pot instead of riveted as they were before. The mezzanine floor was also fitted so that mashing, fermenting and distilling will all be carried out on the same level. 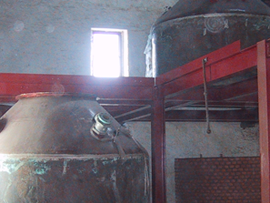 By the end of October 2003 the remainder of the distilling equipment was in place. 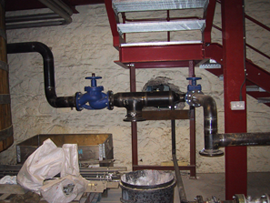 Condensers were fitted and all the necessary pipe work completed. 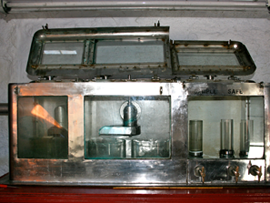 The low Wines and Feints receivers were also fitted, situated below the mezzanine working platform and the spirit safe was installed. Around this time the water connection between Crosshill loch and Mitchell’s Glengyle Distillery was also completed. By November the contractor fitted out the boiler house and installed all the equipment needed to power the distillery for when it is up and running. Forsyth’s also installed the spent grains removal system, fitting all the necessary pipe work between mash tun and draff bin outside. Before Christmas the mash tun gear box was installed, thus completing the entire mashing system. In January 2004, the final links in the production chain were completed when the four 30, 000 liter washbacks were constructed and installed. Arthur Brown Ltd, well established coopers from Dufftown were charged with making the vessels out of traditional larch wood. Around the same time, Forsyth’s completed the milling system needed to grind the malt which is produced at nearby Springbank Disitllery. With the milling, mashing, fermenting and distillation equipment all in place for the end of January 2004, the month of February was devoted to the finishing touches needed for the distillery to be fully operational; all the wiring and electrical work, any remaining pipework and lagging the equipment including stills and pipes. Painting work was going on through out the renovations, some have likened it to painting the Forth Rail Bridge - a never ending task, so a quick spring clean was all that was needed before the grand opening. On the 7th of March 2004, Scotland’s newest distillery, the first to open in Campbeltown for over 125 years, distilled its first spirit. This historic event was witnessed by the J&A Mitchell’s board with the Chairman himself, Mr Hedley G Wright, determining the final cut of spirit taken from the very first sprit run. Campbeltown have three fully operational single malt distilleries all located in the town itself, this makes it one of Scotland’s recognised whisky-producing regions. The town is situated on the Kintyre peninsula, near by the famous Mull of Kintyre, some 240 km from Glasgow. It is a historic Royal Burgh and has been occupied for over 8000 years. Once home to a big fishing fleet, there were also no less than 34 legal distilleries established here during the 19th century, earning the town the nickname “The Whisky Capital of the World”. By 1925, with the closing of the Reichlachan and Glengyle Distillery, Springbank and Glen Scotia were the only distilleries left. 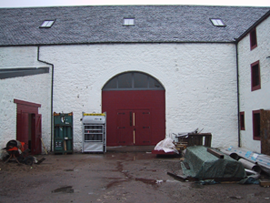 The opening of Mitchells Glengyle Distillery on 25th March 2004 increased the number of distilleries in Campbeltown to three, allowing the town to legitimately reclaim its place amongst the great whisky producing regions.